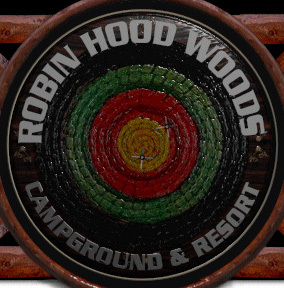 Here at Robin Hood Woods, our whole family and friendly staff pride ourselves on the hard work and dedication it has taken to make Robin Hood Woods one of the cleanest and best-run campground resorts in Illinois. Our facilities have been designed around the need for comfort, safety and a fun-filled family vacation. Our resort is a peaceful and quiet get-a-way in a friendly and neighborly environment. You will feel relaxed and stress-free in our oasis of mature trees and water, which is far from the noise of the city and located in a remote region of America's Heartland know as Shelbyville. We are located east of the Town of Shelbyville and 2.5 miles from Lake Shelbyville. 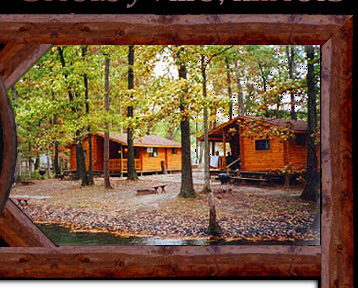 All of our Log Cabins, Cedar Cabins and Family Cottages are clean and cozy and comfortable. We want your stay with us to be both relaxing and fun. They are fully equipped with everything you need for housekeeping. 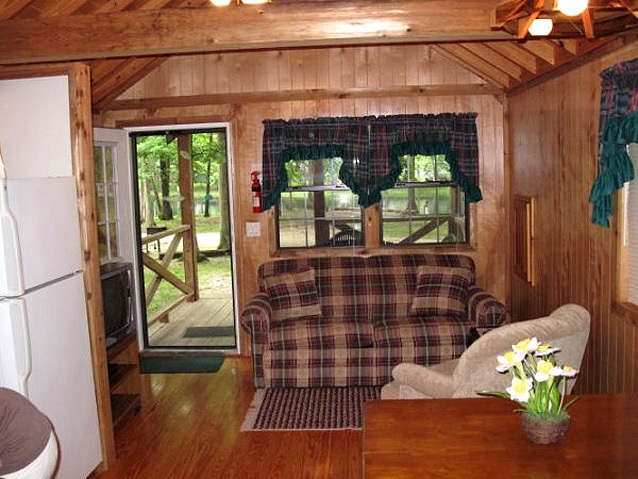 We have multiple styles and sizes of cabins and cottages to meet your needs. We have 2-bedroom waterfront log cabins, one-bedroom waterfront log cabins and single-room open-concept log cabins, which sleep six people each. We also offer one-and-a-half lakefront cedar cabins, which sleep six people. Our family cottages are ideal for small families and sleep four comfortably. Our Campground and RV Park has 250 campsites, which feature 15-amp to 50-amp electrical service. While most campsites are permanent sites for seasonal trailers, we have many campsites for nightly, weekend, week-long stays. Campsites range in size to cater to large RVs and 5th-wheels, as well as tent campers and back-in trailers. Outside firewood is prohibited. Firewood is available for purchase in our store. 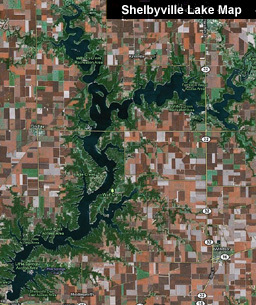 Lake Shelbyville is managed by the US Corp of Engineers. As a result there are no resorts or cottages on the lake. There are marinas and public boat launches. As a result our guests can enjoy all that Lake Shelbyville has to offer. Being only 2.5 miles away from Lake Shelbyville makes Robin Hood Woods a strategic location for accommodations and boat storage. 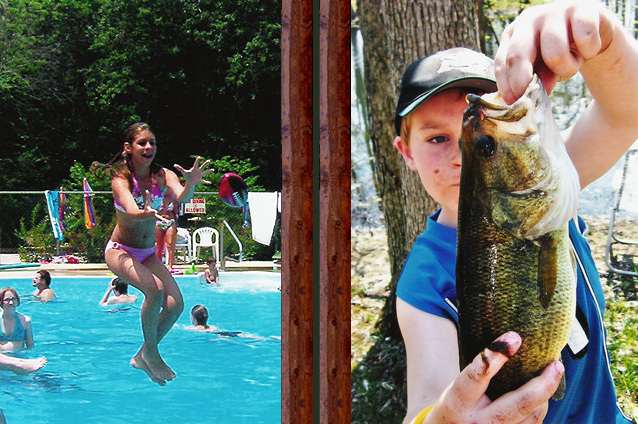 Boating and swimming are major attractions but Lake Shelbyville's claim-to-fame is the outstanding fishing. Largemouth Bass, Walleye, Muskie, Crappie, Flathead Catfish and White Bass fishing is the best in Illinois. Fishing for Saugar, Smallmouth Bass, Bluegill and Channel Catfish is also available. The fishing is so good that Lake Shelbyville is home to thirty-seven organized fishing tournaments, which attract both professionals and amateurs alike. Lake Shelbyville also boasts being home of the Illinois State Muskie Record. We also have our own large 2.5 acre pond, which is stocked with Largemouth Bass, Catfish and Bluegill. To add to our guest's comfort and fun level, Robin Hood Woods offers facilities, which all guests are welcome to use. We have two bathhouses, an outdoor pavilion, store, laundry room, swimming pool, game room, child's playground and surrounding camp are trails and paths for hiking and mountain biking. 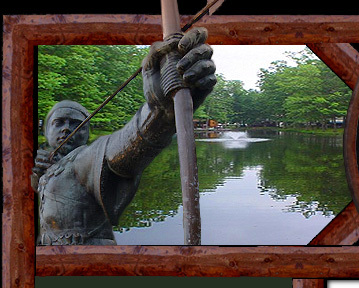 There are also many activities and attractions available in the Town of Shelbyville and the region surrounding Lake Shelbyville such as horseback riding, museums, oddities unique to Shelbyville and many historical attractions. The entire park has free WIFI.